Around and around the Oak Bluffs roundabout goes. 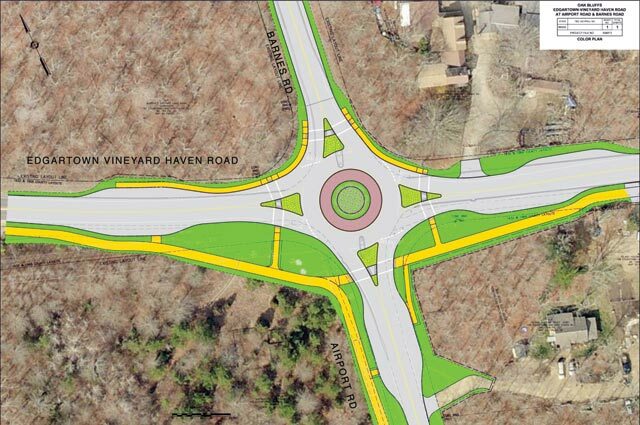 Thursday night the Martha’s Vineyard Commission (MVC) is scheduled to hold a public hearing on the traffic circle the Island’s regional planning and permitting body proposed as an alternative to one of Martha’s Vineyard’s most notorious intersections. The hearing is to determine whether the MVC should review a roundabout at the intersection of Edgartown-Vineyard Haven Road and Barnes Road in Oak Bluffs as a development of regional impact (DRI). The Oak Bluffs selectmen approved the roundabout proposal in 2006, following a study of possible options the MVC prepared and several other public hearings. Massachusetts Department of Transportation (DOT) Highway Division officials presented designs at a public hearing on April 20. West Tisbury officials entered the roundabout discussion on June 22. In a letter dated June 22, the West Tisbury board of selectmen submitted a discretionary referral of the roundabout project to the MVC. Selectman Richard Knabel said he initiated the discretionary referral in response to a lot of questions from West Tisbury residents and other Islanders about why the roundabout was not reviewed as a DRI. The proposed project involves the construction of a single lane roundabout at the intersection, with pavement reconstruction, sidewalks, drainage, landscaping, and other improvements. The intersection currently utilizes a four-way stop-sign system and flashing red lights on all approaches. In response to the West Tisbury selectmen’s letter, the MVC’s land use planning committee (LUPC) held a pre-discretionary public hearing review on July 25. As MVC executive director Mark London explained at the meeting, the commission’s DRI regulations regarding discretionary referrals require a public hearing about whether the project should be designated a DRI by August 9, and a decision made on the designation by August 19. Mr. London said it would be possible to extend the deadline if the West Tisbury selectmen were willing. However, Mr. Knabel was out of town and was not at the meeting. Nor was West Tisbury selectman Cynthia Mitchell, who also voted in favor of the discretionary referral. Oak Bluffs selectman chairman Kathy Burton attended the LUPC meeting with selectman Greg Coogan and former town administrator Mike Dutton. She said she was not in favor of extending the deadline because the Oak Bluffs selectmen want the project to go out to bid as planned in November and are concerned a delay might jeopardize the funding. The roundabout’s construction was delayed until recently, when the state accepted the project for funding under the fiscal year 2012 Transportation Improvement Program for the MVC. The roundabout project is expected to cost about $1 million. Of that, the federal government would pay 80 percent and the state Highway Division the remainder. The hearing starts at 7:15 pm tonight at the MVC offices on New York Avenue in Oak Bluffs.